Perth - Australian media on Tuesday blasted the national team's "monumental failure" in the third Test against South Africa while lamenting the end of former skipper Ricky Ponting's illustrious career. South Africa thumped the Australians by 309 runs in Perth to hold on to their number one Test ranking and ruin an emotional farewell for Ponting, who bowed out after a 17-year Test career. Set an improbable 632 runs to win, Australia were dismissed for 322 with a day to spare. 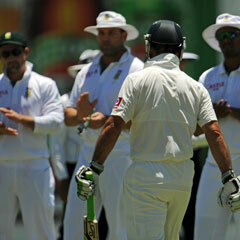 Ponting, the second highest runscorer in Test history, was out for just eight after he was given an honour guard by the South Africans. "Champions contemptuously put the Australians in their place," said The Australian newspaper. "Perth was a monumental failure at a critical moment and a timely reminder that Michael Clarke's side is number three - better on a good day and worse on a bad one like this," said their cricket writer Peter Lalor. "Never was the gap between one and three writ more large than in this game." The Sydney Morning Herald said: "Proteas use momentum to absolute advantage", while bemoaning Australia's "missed opportunity" to grab the number one world ranking. The first two matches in the three-Test series ended in draws. "It was disappointing enough that Ricky Ponting's last hurrah was an unremarkable scratching together for eight runs," the newspaper added. "For the ambitious Clarke, though, the whole debacle will be viewed as a missed opportunity to crown his captaincy with a return to the top of the Test charts." While the team's failure to win the series came in for some stinging criticism, there was praise for Ponting in his 168th and final Test, finishing his career with 13 378 Test runs at 51.85, including 41 centuries. "In the blurring of an eye, and 13 378 runs, it was over," The Australian said. "Ponting might have mistimed his final shot but not his departure," the newspaper said. "Better sweet sorrow at parting than a welcome overstayed." The Herald, likewise, dedicated column inches to Ponting's farewell but also looked to the future, questioning what should now happen to the team's batting order. "One of the most pressing issues for Australia after the South Africa series is an inconsistent top order that only once in five innings reached 100 by the time the third wicket fell," it said. Sydney's Daily Telegraph also highlighted top order failures, saying: "Batting drought bad news for Ashes," referring to the series with England next year. "Had the next generation been more productive, he (Ponting) may not have lasted so long, reinforcing the most pressing problem, a lack of batting depth heading into next year's Ashes," the paper's Malcolm Conn wrote.